A cinquain is a form of poetry that is very popular because of it’s simplicity. It was created by American poet Adelaide Crapsey about 100 years ago, and is similar to Japanese poetic forms, such as haiku and tanka. Cinquains are just five lines long, with only a few words in each line, making them easy to write. Though they are just five lines long, the best cinquains tell a small story. Instead of just having descriptive words, they may also have an action (something happening), a feeling caused by the action, and a conclusion or ending. Activity: Create a cinquain poem about a character from a book or about yourself. You may use the format and example above to help guide you, download a Cinquain Graphic Organizer or click on Write a Cinquain for a digital format. 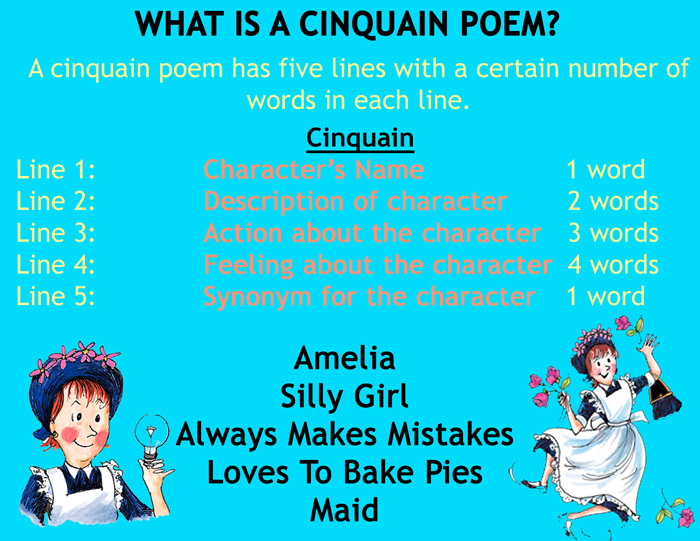 Create an original cinquain poem about a character from a book or about yourself. Please write your name and class in your post. Some poems will be read during lunch time on Wednesday 4/17/13. This entry was posted in National Library Week, Poem In Your Pocket, Poetry Activity. Bookmark the permalink. Awesome poem! Thank you for sharing! Mahalo for sharing our poem! Nice poem Katelyn!!! Mahalo for sharing. Awesome poem! Mahalo for sharing. I can tell you like drag racing! Mahalo for sharing your passion in a poem. Awesome Poem! You come from an ‘ohana that have beautiful singing voices. Thank you for sharing your poem. Beautiful poem! Thank you for sharing. Cute! Kacelyn is a beautiful friend. Mahalo for sharing your friend poem. beautiful poem about your cousin! thank you for sharing your passion through a cinquain poem! excellent! nice poem about your uncle! thank you for sharing. I can tell you like swimming! are you practicing today? Beautiful poem about your cousin Dayten! Mahalo for sharing. I can tell you like dirt bike riding! Thank you for sharing our poem. nice poem about your relative Nalani! Is she your aunty or cousin? Lovely poem about your cousin Kiana! I can tell she is a special girl in your life. Such a nice poem about our beautiful friend Makalapua! I have a feeling you like Geronimo Stilton books! Mahalo nui e ka Papa ‘Ekahi B & Mrs. Littrel for sharing all of your fabulous Cinquain poems! I would like some of you to share your creative poetry writing with us during lunch time today in the dinning hall.